1. Were there any factories in North Korea? 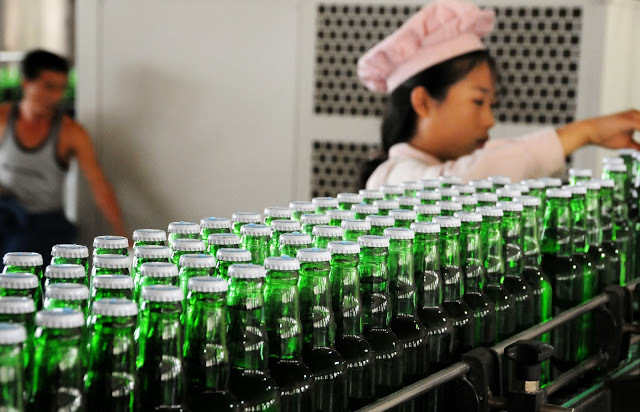 We visited two factories: Kangso Mineral Water Factory near Pyongyang and a food preserves factory near Pyongsong. While the former, a small factory, was working quite dynamically, we found the latter one closed – it was the day after the National Day and all employees had two days off (or so we were told). I found the equipment of the food preserves factory could date back to the 1970s but everything was clean and well kept. Only the best factories and installations are likely to make the approved list of the places accessible by foreigners though; there certainly are other factories in North Korea but we did not get a chance to see those. 2. How was the agriculture? 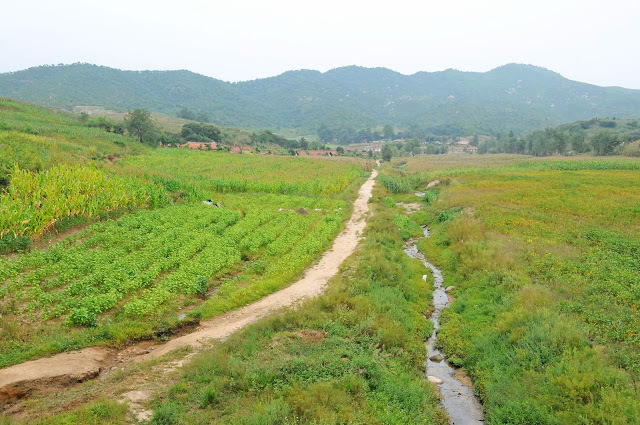 The parts of North Korea I visited looked vastly agricultural, in line with the government’s pursuit of self-reliance, including on food. 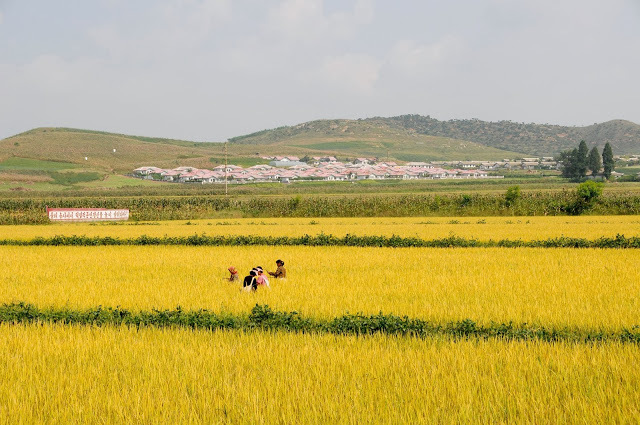 Stretching fields of rice and corn with high hills in the background are likely a typical image of peripheral North Korea carried away by foreign visitors. 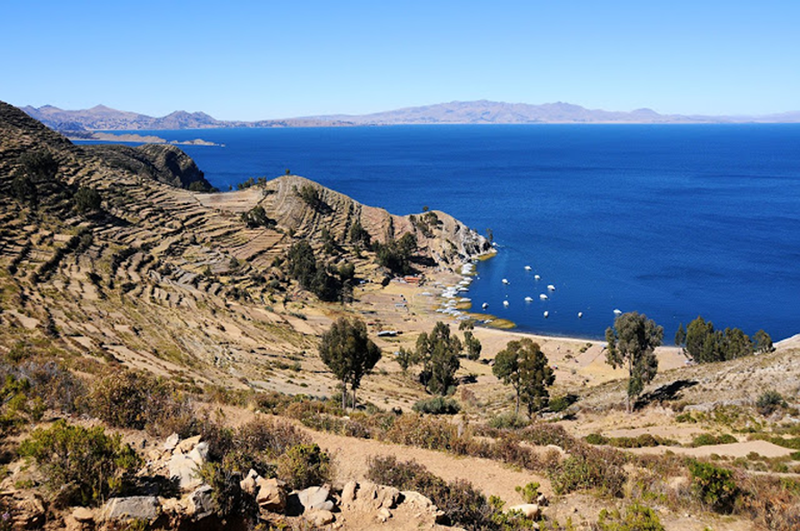 This, however, is the country’s agricultural heartland: only about 18% of its territory is arable and the most fertile regions lie in the west – precisely where we visited – the rest being largely made up of rugged mountainous terrain. 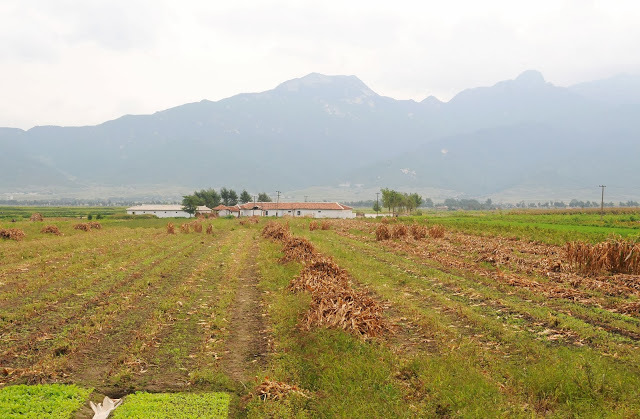 I have little idea of what the situation is like in less fertile parts of the country but hear of certain differences – one example being the potato, which is almost non-existent outside the north of North Korea, where it effectively replaces rice and corn. 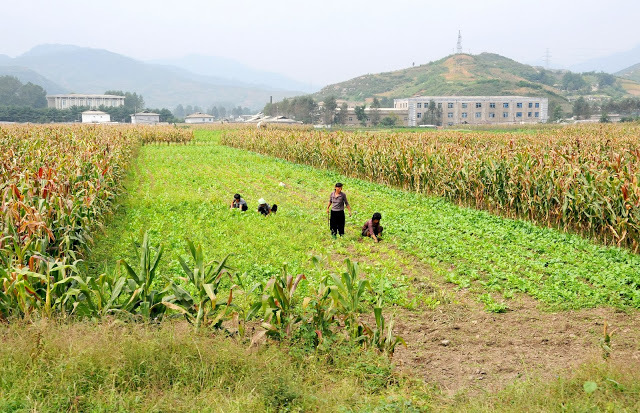 One striking feature of North Korean agriculture is the near absence of mechanisation. 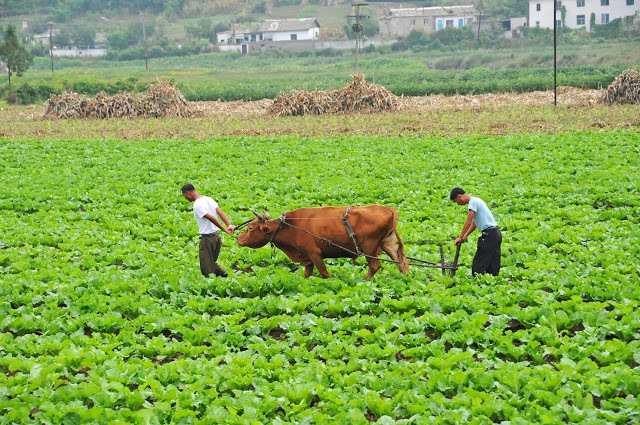 There are very few machines used to cultivate the fields while manual and cattle-assisted labour is prevalent. I asked our guide Mr Ju about this, only to be told that the switch to mechanised cultivation requires irreversible adjustments to the fields which are “presently being implemented” while the necessary machinery “has been bought already”. Once everything is completed, North Korea will no doubt torpedo itself into the bright future. 3. What was the architecture like? It is important to remember that both parts of the Korean peninsula suffered horrendous damage during the Korean War of 1950-1953. The North suffered relatively more, due to the US heavy bombing and the scorched-earth policy of the retreating UN forces. In fact, the US Air Force estimated the destruction imposed on North Korea to be greater than that of Japan during the WWII – where the US forces turned 64 cities to debris and dropped an atomic bomb on two more. 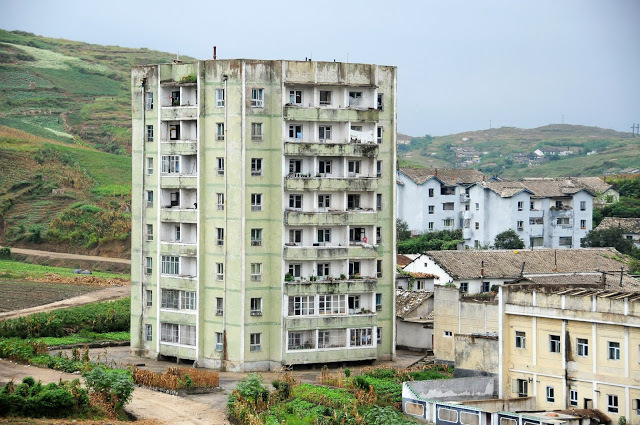 Therefore close to nothing survives of North Korea’s pre-war architectural heritage. 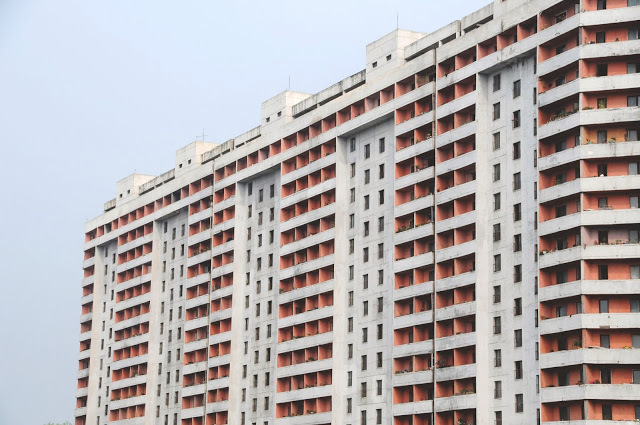 The remnants of Pyongyang’s old town have been replaced with two types of buildings: first, massive greyish panel blocks closely resembling their cousins in the former USSR and East Germany and, second, bombastic glitzy structures built to glorify the state. More traditional, low-rising huts are common in the countryside. 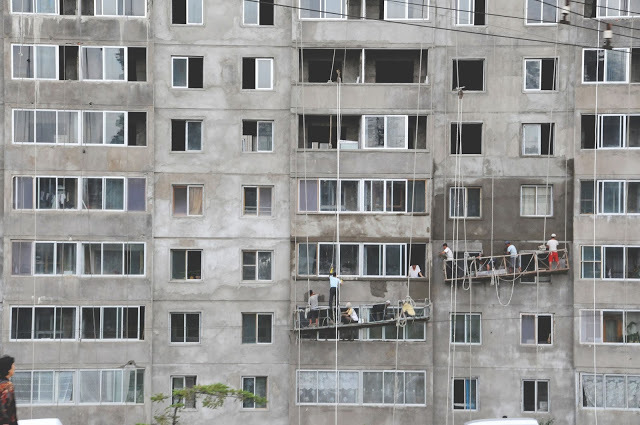 I have heard rumours about similar huts hid carefully from foreign eyes amid the concrete blocks of Pyongyang – making up a sort of North Korean “slums” similar to the moon cities of Seoul – but I have seen nothing to confirm those. 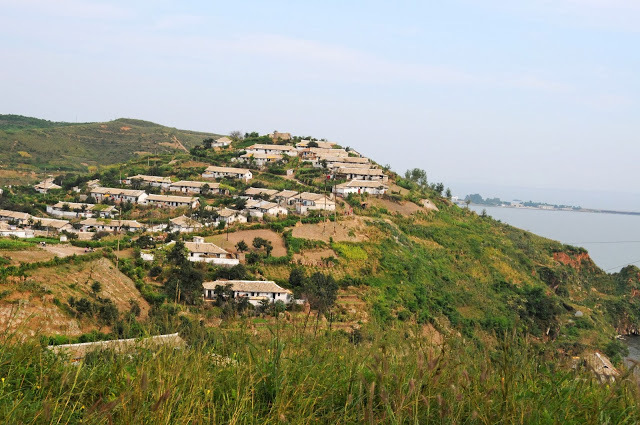 The only place in North Korea with a decent collection of preserved traditional buildings is Kaesong, the former capital of the Koryo dynasty. During the Korean War, the city housed the armistice talks and was therefore somewhat spared from the military action. 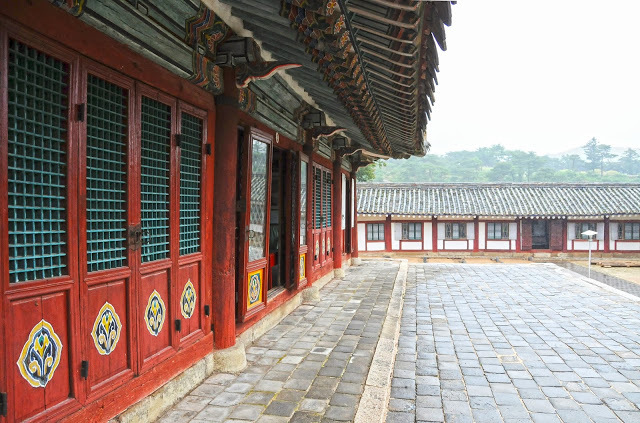 I visited the Koryo Museum – housed in Kaesong’s former Confucian academy (seowon), the museum contains many priceless artworks, with the tombs of nearly all Koryo kings located in the area. 4. What currency was used? The official currency of the DPRK is the won (KPW). However, the won has a very low value in the international markets, and the role of the DPRK’s de facto currencies is played by the euro (EUR) and the Chinese yuan (CHY). The US dollar (USD), formerly the main foreign currency of North Korea, has gradually lost circulation although it does continue to be used. Paying foreign currency for any purchases in North Korea will often result in receiving multi-currency change – most sales assistants have tills well stocked with three major foreign currencies, but shortages of one or two do happen, so other currencies (or chewing gum, matches, etc) are used as replacements. I would recommend bringing euros as your main currency but, if you aren’t from Europe, Chinese yuan will likewise get you everywhere in North Korea – and, given that every tourist enters from China anyway, yuan should be easy enough to get. It is illegal for foreigners to use the North Korean won. There are no ATMs anywhere. Some souvenir shops sell won as souvenirs but these are pre-2009 notes which are no longer in use. The only way to obtain the real won is to buy it off somebody local if you get a chance. The only person in my group to end up with a won note (of 200 KPW – less than 5 euro cents on the jangmadang, or black market) found it by chance, all black, torn and greasy from heavy use, at the Golden Lane Bowling centre in Pyongyang. I think it was a note of similar denomination that our bus driver used to start a fire on our first night in North Korea, in the absence of other paper – quite an introduction to the DPRK for us! And no, to answer the question many of you had, the note did not feature any of the Kims – only the note of the highest denomination, KPW 5,000, depicts a member of the Kim family (namely Kim Il-Sung). Burning that would not be advisable. 5. Did your phone work? Until quite recently (January 2013) all tourists surrendered their mobile telephones at the customs when entering North Korea and received them back before departure (irrespective of the means of transport). This has now changed and everyone is allowed to carry a mobile phone into North Korea. Foreign SIM cards do not work. A local card can be purchased, but foreigners and locals use different networks, so calling locals is not possible. Korean tour guides are allowed to use foreign SIM cards to keep in touch with foreign tour leaders within the country. It is possible to call abroad (not text though), but call charges are quite high. See them here (The bottom photo is my personal favourite; dressed in your grandfather’s best mackintosh, sneaking by the side of a cornershop as you try to get data connection furtively on your phone – “this could be you”!). 6. Did you have internet? 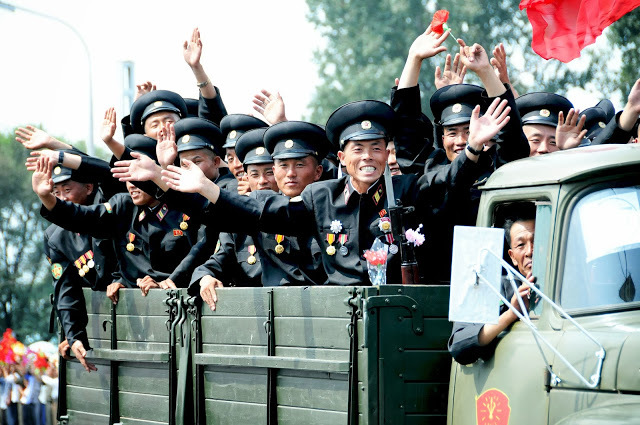 Generally, nobody but the senior cadres have internet access in North Korea. There is a slimmed-down version of the internet, the local “intranet”, available for local use free of charge and mostly carrying study and news materials. 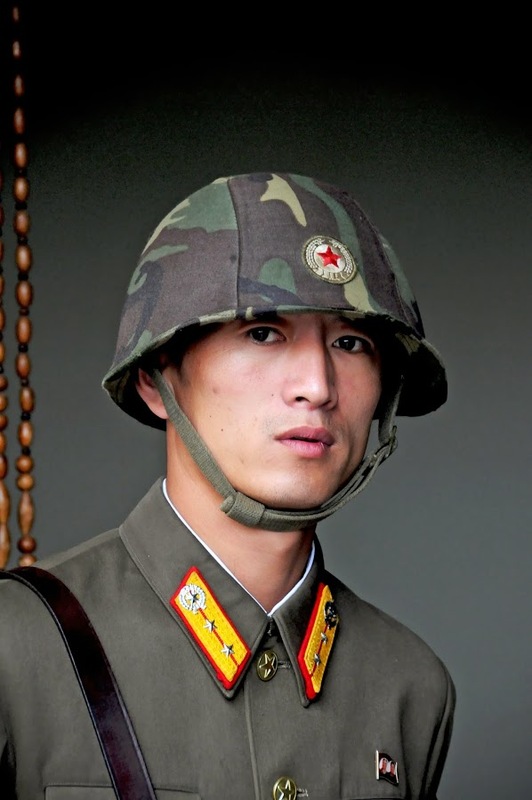 Staying in North Korea indeed means complete abstinence from the internet. 7. Could you send post? It isn’t a problem to post anything as long as it isn’t to South Korea, in which case your mail will not be delivered. It is also imperative to remember certain rules; for example, stamps carrying an image of any of the Kims should be arranged in a straight line and not ever be upside down or sidewards. 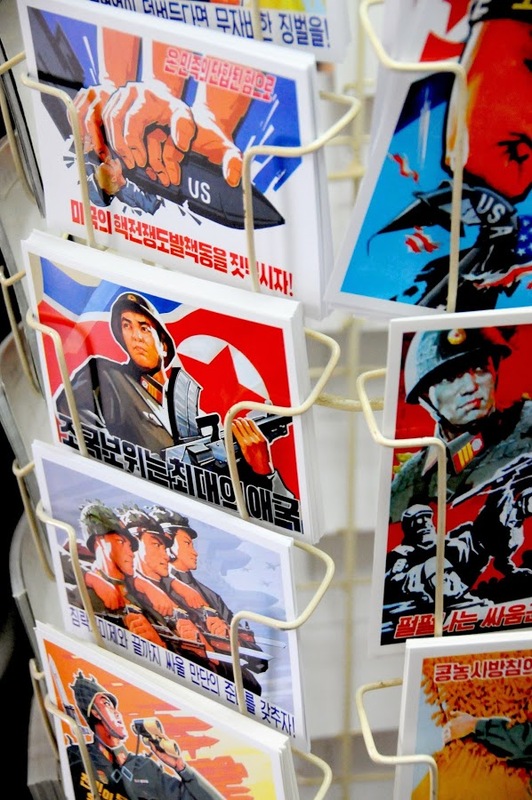 Most messages abroad are censored, so writing anything offensive or suggestive about the Kims or the regime is certainly not the way of ensuring your mail reaches its recipient (unless you use a less common language, of course – the likes of Latvian or Albanian would probably fly just fine whatever is written). North Korea does not have the means to use air mail, so post service is by ground transport and can be painfully slow. A postcard I sent to my parents in Latvia took over five weeks to arrive while, nine weeks on, another postcard still doesn’t seem to have reached my in-laws in the UK. Travelling across water has probably proven an insurmountable obstacle – or the rather negative images of the US on the postcard (sorry, they were so brilliantly antagonistic I simply couldn’t help it) were possibly a little too much for the Royal Mail. 8. Was there political propaganda everywhere? There is propaganda literally everywhere. 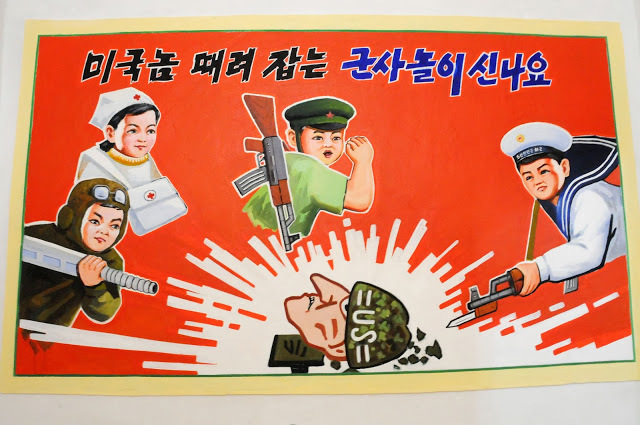 It more or less plays the role of advertisements, which are completely absent in North Korea. 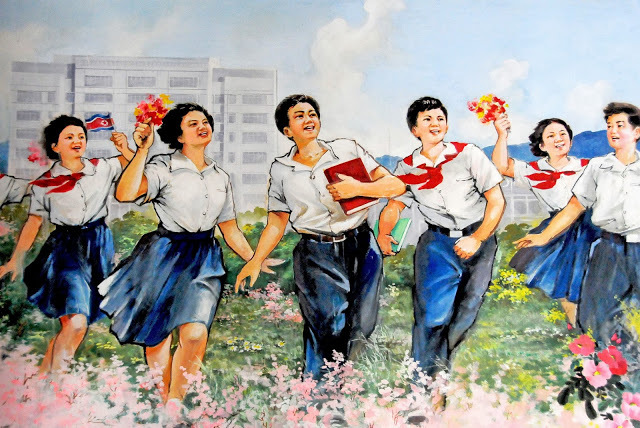 Instead, the faces of the departed Kims are smiling from the crumbling facades while loud communist slogans – “Let’s defend the Central Committee headed by the Great Comrade, Kim Jong-Un!”, “Celebration! 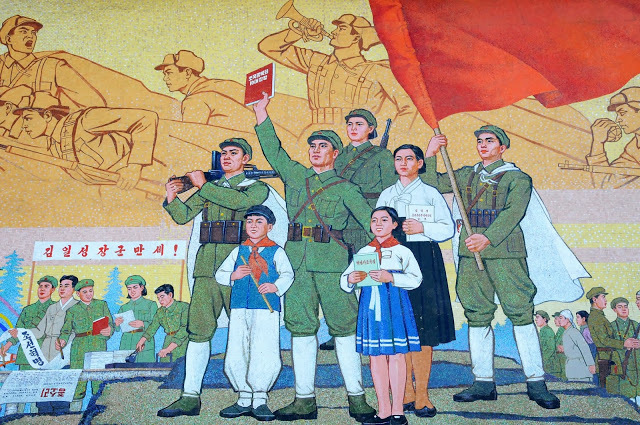 65 years of victory and glory!”, “The Great Comrades, Kim Il-Sung and Kim Jong-Un, are forever with us!” – scream from the rooftops and roadside posters. 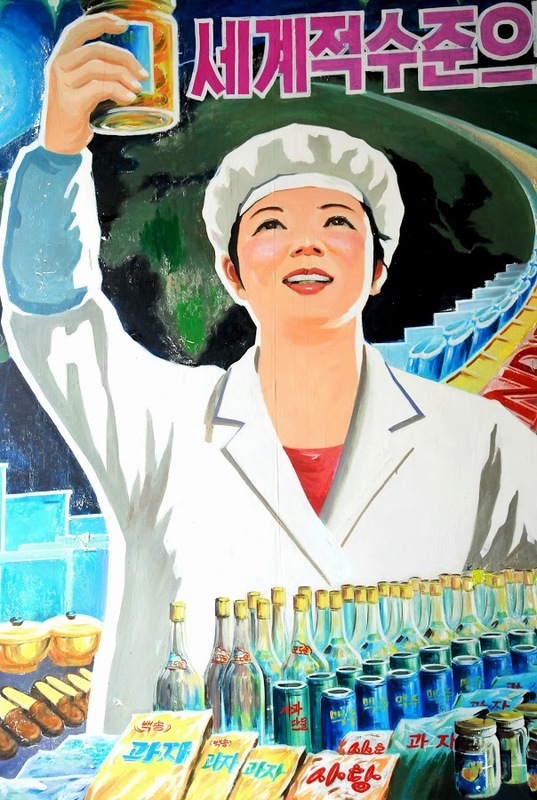 Often the bright, colour-radiating revolutionary mosaics and phrases are the only sources of colour in an otherwise grey urban landscape in Pyongyang – and indeed other North Korean cities. 9. Can you cross into South Korea? I know of three border crossings between North and South Korea: near the Kaesong Industrial Complex, at the DMZ proper and near Mount Kumgang. Only the former, however, operates regularly and is used by South Koreans working in the Kaesong Industrial Complex to cross north where the facility (now open again) is located. Quite famously, the DMZ crossing was last used in August 2013 by a New Zealand couple to make a motorbike crossing after months of negotiations (quite ironically, it is South Korea that took longest deciding). Finally, the crossing near Mount Kumgang – formerly frequented by South Koreans – has been shut since 2008 following the killing of a tourist by the DPRK border guards. North and South Korea are divided by the 250 km long DMZ which, despite its name, is in fact the most heavily militarised international border in the world. 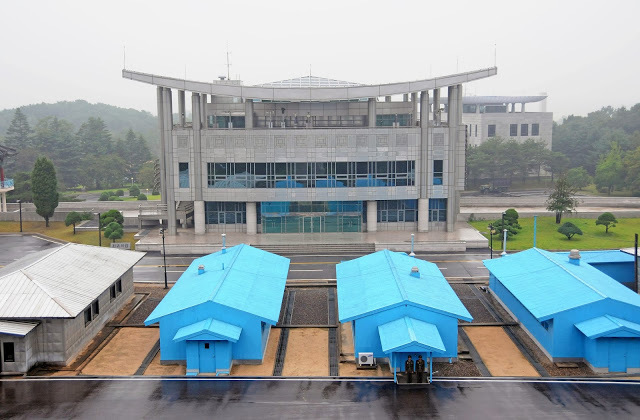 The DMZ resulted from the Armistice Agreement of 27 July 1953, in accordance with which each side involved in the Korean War moved its troops 2 km back from the front line. The DMZ is thus 4 km thick and serves as a buffer zone between North and South Korea. It is controlled by both Koreas and the UN and is indeed the world’s last remaining frontier of the Cold War. I visited the DMZ from the North Korean side. The visit involved a short tour of the Armistice Hall where the namesake agreement was signed in 1953 and a chance to take photos in front of the actual Military Demarcation Line (MDL). We saw the famous blue huts, too – used for infrequent family reunions in the past, they currently stand idle as such reunions have been suspended. Unfortunately this also meant that tourists were no longer allowed to enter the huts. And, as much as we’d hoped to see both sides’ soldiers, the border looked almost entirely unmanned. 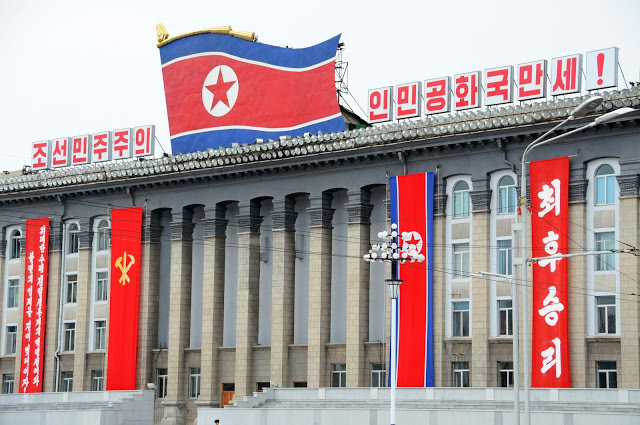 It was also too misty to spot the famously tall flagpoles on either side – the North Korean one is 160 meters high and allegedly the tallest in the world, while South Koreans, initially keen, have gradually given up on the flagpole race. 10. Can South Koreans visit North Korea? As a general rule, South Koreans cannot visit North Korea on South Korean passports. However, as I happened to see myself, the rule is relaxed for major sports events. The Asian Cup and Interclub Weightlifting Championship was held in Pyongyang in September 2013 (during the time of my visit), and we spotted a team of 41 South Korean athletes at the Yanggakdo Hotel, sporting national colours and capitalised “Korea” written across their backs. I later read that the event marked the first occasion when South Korean athletes carried their national flag along with their country’s official name (대한민국, Daehan-minkuk) in North Korea. More significantly, it was also the first time when the South Korean national anthem was played during a flag raising ceremony in Pyongyang (following two South Korean athletes winning gold and silver medals). 11. Did you see any labour camps? I think the answer is clear: no. Labour camps (and indeed most controversial things) are kept well out of sight of tourists. I think even espionage professionals have so far failed to locate labour camps properly and most of today’s accounts of such camps are based on escaper reports and satellite images. Moreover, I understood that labour camps are not mentioned in conversations of ordinary Koreans, although everyone surely knows they exist. 12. Were there any churches? 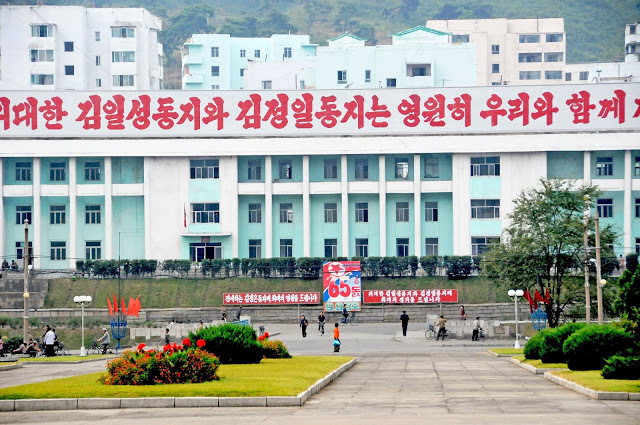 There are four government endorsed Christian churches in Pyongyang: Pongsu and Chilgol Protestant churches, Roman Catholic Changchung Cathedral and Russian Orthodox Church of the Life-Giving Trinity. While driving to a sightseeing site, I spotted the cathedral from the bus but did not have a chance to see if any people were outside. 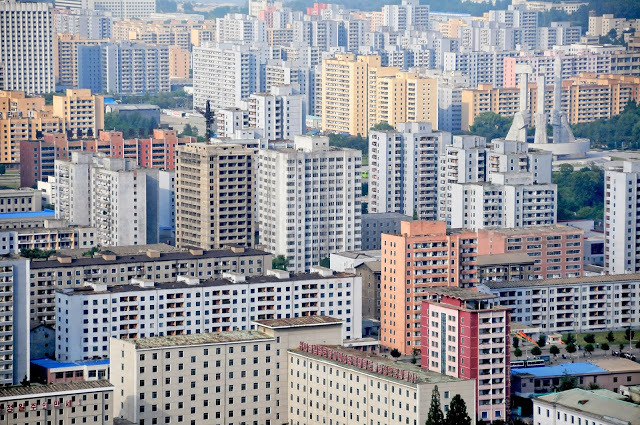 Pyongyang was in the past known as the “Jerusalem of Korea” for its high concentration of Christians on the Korean peninsula; many of those fled to the south during the Korean War. 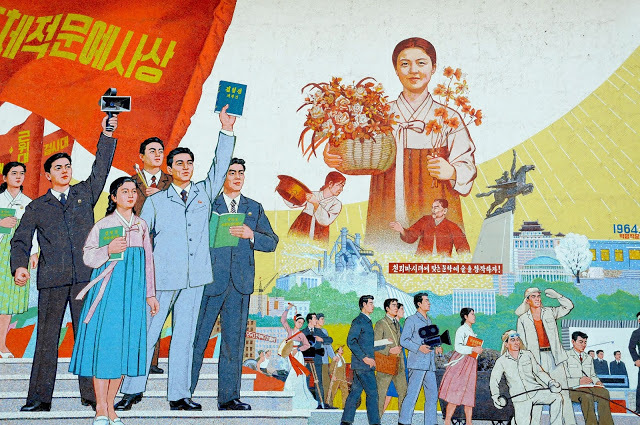 The constitution of the DPRK formally allows the freedom of religion, stating, however, that “No one may use religion as a means by which to drag in foreign powers or to destroy the state or social order”. Unfortunately, it seems that any religion, particularly Christianity, de facto clashes with the personality cult for the two deceased members of the Kim family, Kim Il-Sung and Kim Jong-Il. The portraits of the two are present in every private home, every transportation vehicle and every work establishment, at all times exhibited to be visible from outside through poorly covered windows. North Koreans face punishments for allowing any dust to collect on the portraits, so, for many, no day begins without carefully wiping the surface of the leaders’ images. 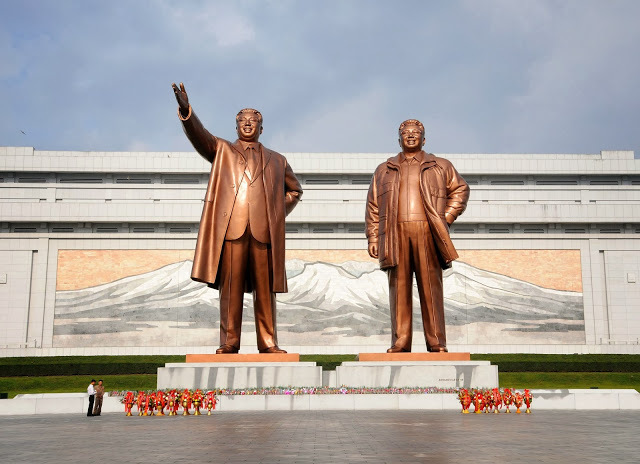 Locals and foreign visitors are required to bow to images and statues of the leaders: the Kims play a de facto religious role in the North Korean society. From several defectors’ accounts, it seems that the four churches in Pyongyang primarily serve as a show for international media and are only visited by the few foreigners in the city, while local Christians meet furtively in clandestine home groups. It also seems that Christians face severe punishments if caught practising their faith. 13. Did the regime look at the verge of collapse? This was the biggest revelation I had during my visit. I made sure to rush myself to visit North Korea sooner than later, thinking that the current situation might just collapse any minute. My trip, in combination with reading several books on North Korea, has helped me to realise that the situation is indeed more sustainable than I had thought. On the one hand, there is the North Korean elite (the cadres) and the loosely defined middle class. These groups enjoy a relatively good quality of life and would risk losing a lot from the change in regime – hence it isn’t in their interest to drive it. On the other hand, there are the ordinary North Koreans – the masses – who are more likely to desire change, but who also have incomparably less power to make it happen. All of this goes hand in hand with the ideology which many North Koreans still believe in, as well as the general perception – thanks to years of propaganda – of the outside world as immoral and corrupt. Even the “brothers and sisters” in South Korea are portrayed to be longing for simple, moral values which the “US imperialists” could not bring them despite ensuring material wealth. The feeling I have now is that there isn’t enough internal movement within the country to make a shift in regime. As long as that is the case and as long as China remains supportive of North Korea – which may last for decades – the change isn’t forthcoming. 14. Don’t you think it was unethical to channel your money to a dictatorship? It is certainly unethical to channel money to a dictatorship. I paid money (granted, a large sum) to participate in an all-inclusive tour of an otherwise closed country. There were certainly costs involved, so at least a part of that sum went towards covering those. I did not feel it was unethical to visit North Korea for several other reasons. First, the Western media has done a very good job painting a monochrome image of North Korea in many people’s minds (talking propaganda here!). Many of those reporters have not set their foot in North Korea once (obtaining journalist visas is an arduous process). I wanted to visit the country in order to see it with my own eyes – within the pre-set itinerary – and make up my own mind. I didn’t end up making up my own mind – if anything, I returned slightly more confused than before – but I have certainly picked up a few missing puzzle pieces. Second, as much as we in the West have a heavily tilted opinion on North Korea, so do the North Koreans about the Westerners. Many of them have never seen a Western person in their life. An image of an American person imposed on North Koreans from early childhood is that of a heartless enemy. 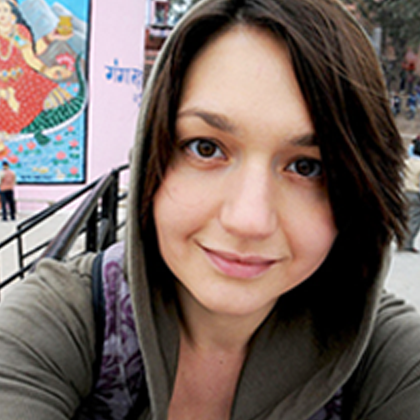 I think it is important for Westerners to continue travelling to North Korea – smile at local grannies, talk to school children, dance with picnicking families in a park and generally act human – to change that image. 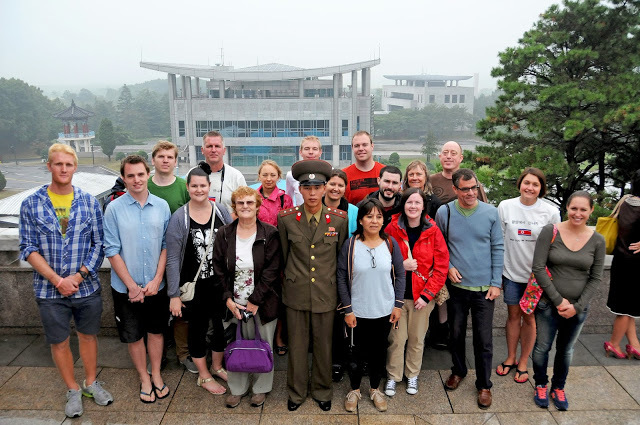 Every Westerner who visits North Korea helps to open the country a little bit more. By no means did I see any of us on the tour as missionaries, but even if one person we met went away thinking those foreigners are not some “weird aliens, after all” – then it was all worth it.